Peaches- cut, sealed and finished. Like a fool, here I am. Bought too many, for me to can. Oh yah, baby… here I am, cut, sealed and finished. Ummm. in that time that I spent over the stove. I just thought about to cry. seen a lot of produce in this world. Here I am, cut, sealed and finished! We actually did 250 lbs – each quart jar has on average 2lbs of peaches. We did 108 quarts so some peaches may have been harmed in the making of this blog post. (Eaten, they were eaten). Little piggies are happy,t hey had some skins. You can also make a syrup with honey if you don’t want to use processed sugar. then you water bath or pressure can according to your times. Yum! We use these weekly ~ cobbler or baked oatmeals!! 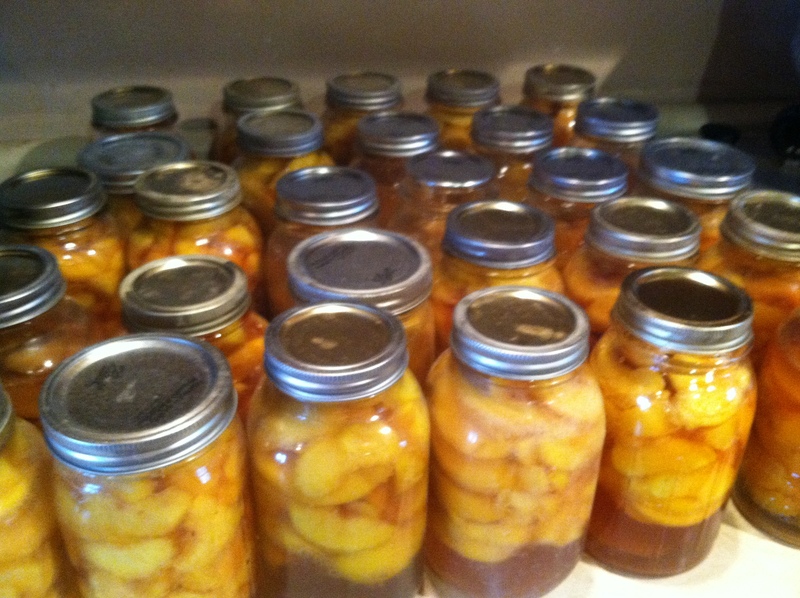 This entry was posted in Uncategorized and tagged easy canning, peaches, sugar syrup by familyplushomestead. Bookmark the permalink. I’ll be delighted to be there to enjoy the cobblers – with ice cream, of course! Wow!! The peaches look yummy!! !